Happy Saturday, everyone! 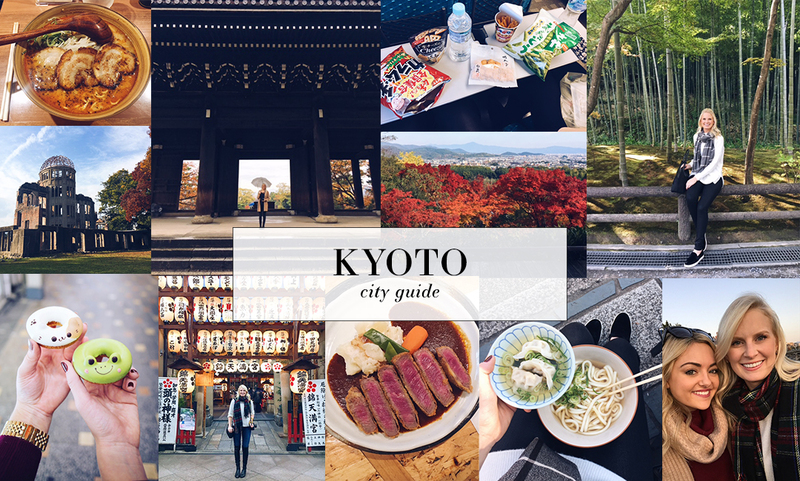 Last week I brought you my Tokyo City Guide, and this weekend I’m back with the next city from our travels: Kyoto. Here in my Kyoto City Guide, you’ll find my favorite places we ate, best things to do around town, and tips for finding the right place to stay in this bustling city in central Japan. AirBnB – as I mentioned in my Tokyo City Guide, renting via AirBnB made the most sense for us for both Tokyo and Kyoto. We spent a total of five nights in Kyoto, so it was nice to have some extra space to get workouts in, do laundry, and have a working kitchen. We stayed in this apartment and LOVED it! There was a ton of space, especially in the living area, and because it’s a pretty new building, all the appliances are very nice and new. It was also really nice being on the first floor – we didn’t have to lug our big bags very far! If that particular place isn’t available for your trip, I would recommend finding something nearby a recognizable street or monument. We had a lot of difficulty with the cab drivers in Kyoto – NONE of them spoke English or could read the maps on Google (not surprising, but it made things a little more tricky). We even had the address in Japanese, and for some reason they couldn’t figure it out! After a few days, we finally figured out where to tell them to go, and then we just walked a couple blocks to our place from there. Ryokan – another popular accommodation choice in Kyoto and smaller parts of Japan is by staying at a Ryokan. It’s a traditional style Japanese guest house, which includes a room and usually a few home-cooked meals are included. I have to say, I was expecting these small bed-and-breakfast-type homes to be less expensive than the hotels. NEWS FLASH – they aren’t. In fact, many are even more expensive. Maybe it’s because of the traditional experience, Japanese design, and home-y feel, but most of the ones I researched were over $400/night. If you can swing it, maybe try staying at a Ryokan for a couple nights and then at an AirBnB the other nights? One day I’d like to stay in one, but this trip we didn’t want to spend a fortune on our stay since we were there for so long. Hotel Kanra Kyoto – for a boutique hotel experience with some Japanese flair, try this sleek spot. Lots of space, streamlined Japanese design and all of the modern conveniences you’re used to. Ritz-Carlton Kyoto – if you’re looking for a more traditional luxury hotel, there’s always the Ritz! It sits along the Kamogawa river, and features Zen gardens, a waterfall and dozens of paintings by local artists. The rooms are large and with some amazing views of the surrounding area! Sumibi Torito – this place was on our list already, but we accidentally stumbled on it when trying to find a restaurant near where we were walking around! Unfortunately they were booked that evening, so we kept walking. The next day, however, we called and made a reservation and got in that night! If you love a good skewer, this place should be on your list. We loved the tomato salad and the veggie spring rolls we had as apps, then ordered the chicken + tomato skewers, chicken + cheese skewers, and chicken meatball skewers. We also ordered the fried chicken (SO GOOD) and the baked rice ball (it’s just rice, but it’s got some crazy good flavors and spices rolled into it). For dessert, you absolutely have to order the sweet cream cheese. I feel like it would be pretty easy to recreate at home too… Maybe I’ll experiment when I’m done with Whole30! Hafuu Honten – before leaving Japan, we knew we had to try some of the beef here. Obviously Kobe is the first thing that comes to mind, seeing as it originated here. We didn’t have a chance to visit the city, but we did get some damn fine beef in Kyoto at Hafuu Honten. This was one of the nicer dinners we had on our tour of Japan. We were so hungry by the time we got to the restaurant, we both ordered salads, entrees and a second entree to share! To be fair, we ordered the second entree so we could try one of their specialties. First, since you can nearly never find greens or salads of any kind on menus in Japan, we had to order salad. We were both craving it! I ordered the garden salad, which in addition to being fresh, crisp and delicious, was beautifully presented. For our entrees, we both ordered the Wagyu Filet, which came with three dipping sauces, au gratin potatoes and some root vegetables. The meat was some of the most flavorful and tender I’ve ever had, including all of the steak restaurants I’ve dined at in the US! While you definitely don’t need to use the dipping sauces, all three were divine. I couldn’t choose a favorite! The specialty we ordered to share was the Wagyu Beef Cutlet, which was basically just deep-fried beef. It was ok, but doesn’t hold a candle to the filet. The filet beats it out in flavor, texture and everything in between. Finally, we enjoyed the creme brûlée and blood orange sorbet dessert. The whole meal was beyond. PS – they actually had wine! Not many of the places we went to in Japan featured anything other than sake or beer. Like Sushi Iwa, this place is a little more pricey, with the meat dishes coming out to around $50 per person. Abura Soba Nekomata – on that rainy day we explored Eastern Kyoto, we explored for several hours and by the time we were ready to eat lunch, we were ravenous. It was rainy, so we were both in a hurry to get inside and warm up. Not sure if I mentioned this already, but so many of the restaurants feature food photos or displays of fake food outside to lure you in. More often than not, the displays totally grossed us out and convinced us to keep looking. After peeking into several restaurants on Higashi Oji Dori, we finally found this little soba spot. The menu features all kinds of noodles, but soba is their specialty. We ordered two appetizers, the fried chicken and the gyoza, followed by two heaping bowls of soba. This whole lunch warmed us from the inside out. The food was very flavorful and offered different flavors than we’d had before, which was nice. Definitely recommend this little restaurant for a casual lunch! Arash’s Kitchen – the same night I mentioned above where we couldn’t get into Sumibi Torito, we happened upon Arash’s Kitchen down the street. You may be surprised, but this was actually already on my list for later in the week – I had a feeling we’d need a break from noodles and sushi, and this place kept popping up when I was researching Kyoto eats! It was a welcome surprise seeing it down the way, considering we’d just been turned away at the other restaurant! It’s a very casual Indian restaurant, so it’s a good choice if you’re looking for something fuss-free after a long day of exploring. Apparently on Saturday they have belly dancers at dinner (we saw it on a sign when walking in the restaurant), and guess what night we were there?… It was totally unexpected, but made for a fun and interesting dinner situation. Order the hummus and the chicken tikka masala (always my fave dish). Sushi Iwa – if you’re not sick of sushi yet, you have to make a reservation at Sushi Iwa! This place was on a bunch of “best restaurant” lists, featuring names like Bill Gates and Steve Jobs as fans of the restaurant. When I first saw that, I was worried we wouldn’t be able to get in, so we tried to get reservations at a couple other places before trying this one. It seems fate didn’t agree. The phone just kept ringing at one place, and at another we couldn’t ever find a phone number for it! So with that, we called Sushi Iwa. They could only take us at 8:30, and told us that we wouldn’t be able to sit downstairs – at the time, we didn’t realize the chef was a huge deal and people sit down there so they can watch him make everything! We said all of that was fine, and booked the reservation. From the moment we arrived, the servers and chef at Sushi Iwa took care of us. They managed to squeeze us in downstairs after all, gave us a very detailed rundown of the menu and answered questions, and even provided more recommendations for us in Kyoto and Hong Kong! Finally, as if the service could get any more lovely, the chef actually came with us out to our taxi and helped us tell the driver where we were going. In addition to making incredibly fresh and inventive plates, he was so kind and helpful. Not anything you would expect from a fancy, top chef! Highly recommend Sushi Iwa for a date night or fancy occasion – it’s a little more pricey than the other places we ate in Japan, so just keep that in mind! Ramen Sen No Kaze – if you’re in the area around Nishiki Market, put your name down on the list at Ramen Sen No Kaze. It was an hour wait when we arrived, but luckily there was a cute place down the street where we got drinks as we waited (more on that below)! This popular join is known for their traditional ramen noodle soup and gyoza (pan-fried dumplings). I ordered the #26 (a spicy miso-based ramen), and Jessica ordered the #3 (the local favorite). We ate every last bite! So good. Even though there was a long wait, the service is very fast once you sit down. Matsuantoko – as I mentioned above, this is the spot around the corner from Ramen Sen No Kaze where we grabbed drinks. They actually had a wine list, which was a welcome surprise! In addition to each having two glasses of Sangiovese red, we finished an order of pretty perfect french fries while we waited for our table at Ramen Sen No Kaze. Another bonus, they play movies on the wall above the kitchen! Our table was directly in front of it, and of all things, they were playing my fave: HARRY POTTER! This spot is warm and welcoming, and while we didn’t have anything other than french fries and wine, the food we saw other people getting looked great! Elk – This cute little cafe is just steps from Nishiki Market and all the great shopping in that area. You probably saw my SnapChats of the 3D cappuccinos we ordered featuring the little animal faces made of foam? We saw it on a sign and knew we had to get them. So adorable!! Also, the coffee actually tasted like coffee, which was great. We had so much coffee over there that tasted like milk! They don’t do coffee the same there as they do here. We didn’t order any food, but we did see several plates come out that looked very decadent. They are known for their breakfast (which they serve all day), and the pancakes are their specialty! Eggs ‘n Things – it’s not easy to find regular breakfast food, or at least the kind we’re used to in the US, in Japan (unless you’re trying to eat McDonald’s every day). If you’re craving eggs, pancakes or other traditional breakfast food, stop in this cutie little spot near Nishiki Market. The decor and ambiance is adorable! We actually found this on our last night in Kyoto and never had a chance to eat here, but it looks awesome!! Nishiki Market – this 300 year old market features everything from fresh seafood stands to candy stores, all from local vendors! If you’re feeling adventurous, pick up a few items to take back to your hotel/AirBnB – a lot of it is food you can only find in Japan! Jess and I tried several savory snacks and pretty much every one was delicious. I would recommend going in the morning to see the hustle and bustle, and the freshest merch. We went around 4pm, and a lot of the vendors had already sold out of their product and were closing up shop for the night! Check out my photos from the market here. Teramachi + Shin Kyogoku Arcades – if you’d like to pick up some Japanese treasures, souvenirs, etc stroll through the shopping arcades of Teramachi and Shin Kyogoku. These two spots are actually connected to Nishiki Market, so I’d do all three in one fell swoop. This is where Jess found her cute rose gold Nike sneakers, we found more varieties of Kit Kats, and these adorable little donuts! Visit a Cat Cafe – this is SUCH a weird pastime in Japan, but it’s hysterical to see. We never actually went in one (neither of us really like cats), but we did peek in one from the street – there are a couple right by Nishiki Market! A cat cafe is exactly what it sounds like. You basically pay to go in and pet/play with cats. It’s supposed to be therapeutic! Explore Eastern Kyoto – there are so many old temples, shrines and local shops all over the Eastern portion of the city! I would dedicate an entire day to discovering this part of the city. There’s a lot to see and ground to cover! Luckily, it’s easily walkable, and there are a number of great suggested itineraries you can find online to help you maximize your time. Click here to check out the temples and shrines we visited as part of our day in Eastern Kyoto! Fushimi Inari – while technically still part of Eastern Kyoto, it’s a pretty lengthy walk if you’re coming from the Yasaka Shrine or others around that spot. We just took a cab over to this shrine, but you could easily take the train if you want to save money! Click here to see my photos from this memorable orange shrine. Attend a Traditional Tea Ceremony – this was actually one of my favorite things we did in Kyoto. It was so fun getting to chat with the tea master and participate in making traditional matcha green tea. We learned a lot about the history of Japan and tea making, which was actually very interesting! According to her, it takes decades of practice and education to become a tea master. You can see some of my photos from the ceremony here. We did ours at Camellia and loved it – be sure to make a reservation! Gion – this touristy spot is Kyoto’s most famous geisha district, featuring numerous shops, restaurants and tea houses in the traditional wooden merchant houses. We didn’t spend a lot of time here due to the sheer volume of people, but it’s definitely worth seeing! Arashiyama – this was our favorite day trip out of all of them! I can’t tell you how many photos we took that day – it was aggressive. We spent the whole day in Arashiyama and still didn’t manage to see everything we wanted to! We did manage to see the Bamboo Forest, the Monkey Park, the Tenryuji Temple Gardens and this Garden. Highly, highly recommended taking a day trip here. Click here to see my posts and pictures from Arashiyama! Hiroshima – if you’re a history nerd like I am, make a plan to visit Hiroshima one day. It’s a 2 1/4 hour trip to Hiroshima via Shinkansen (bullet train), so you’ll likely need a full day to do it and enjoy it. Click here to follow our experience in Hiroshima and find out what to see and do while you’re there! Nara – on our last full day in Kyoto, we took a trip out to Nara. It’s only a 45 minute train ride away, so it was an easy trip! The main attractions in Nara include several temples and shrines, and the deer park. To be honest, we were sort of “shrined out” by our final day, but we really loved walking around the town, doing a little last minute shopping (and eating), and walking through the deer park. Click here to check out my photos from our day in Nara and for things to do on your visit! Such a good guide, thanks for sharing! I went to Kyoto back in school and it was my favourite place in Japan! We went in Autumn too, and the leaves were just too beautiful. I can’t wait to go back again someday.